This Soup is a hearty main dish meal. It requires only one pan making the clean-up a breeze. However, it does require some prep which can be done ahead of time with the cooking done in minutes. It starts with the basic mirepoix, carrots, celery and onions (these can be chopped at cooking time or the night before). Select and prepare the ingredients that you and your family like; these can also be prepared ahead of time. Leftover meat from a roast or steak or stock meat (from making stock) can be used making this extremely cost effective or you can purchase cooked meat from the deli to make this awesome recipe. The results are wonderful with a satisfying, warming taste and texture. Everyone loves this comforting dish and your family will request it over and over! So, what are we waiting for? The preparation time takes between 10 to 20 minutes depending on your knife skills. And, the results are so very worth the little bit of extra effort! 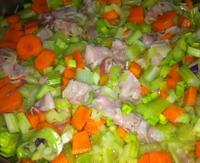 In a medium size soup pan over medium to medium high heat, cover the bottom with just enough good Olive Oil to coat. 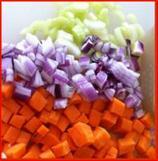 Add Carrots, Celery and Onions and saute for 3-5 minutes. Then add the Sliced Mushrooms and cook for another 2-3 minutes. When these are crisp tender, add the Broth, one ladle at a time until desired amount of liquid has been reached (more for a thinner result, less for a chunkier style). Heat to boiling and then reduce to a medium simmer. Add Corn, Peas, Sugar Snap Beans and Beef. Continue simmering until Beans have softened a bit. 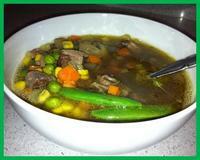 Beef Vegetable Soup is so simple to make and I can't begin to tell you how delicious it is. So 15 minutes longer than opening and heating canned soup will get you this wonderful meal, made exactly to YOUR taste without chemicals and additives, a healthy choice for your family and making YOU the Everyday Gourmet!